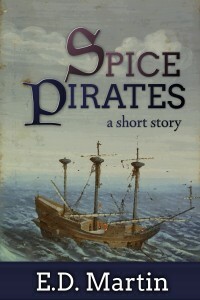 For July and August, I’m pulling from “Spice Pirates,” my long short story that I’d planned to have live on Amazon already but other deadlines have been getting in my way. So, fingers crossed it’ll be soon! For this scene, someone stole all Origano’s money so he stole some food from Rosamaria’s father’s food stand. She chased him, went through his belongings, and discovered a treasure map. Before he could react, she grabbed the map from his hands, tore it in two, threw half at him, then then hitched up her skirts and ran down the alley. Origano thought to chase after her, but what good would it do if her father, whom she’d said hated pirates, were at the stand? Instead he sunk down against a wall, head in his hands. He’d bought that map from a tinker passing through his village and had no idea as to its authenticity; he’d planned to follow it as soon as his ship had landed. And now this beautiful girl thought he was a pirate and had half his map! He shook his head and sighed. What had he gotten himself into? Where there is trouble, there will be a girl! I’m glad a female said this. Ahem! Oh, what a troublemaker she is! Though it only seems right that a pirate run into a few obstacles. I guess that’s the equivalent of giving her phone number? LOL! Great snippet!